Vermeer FTX25 footings trencher easily fit into tight jobsites more easily than a compact excavator. The FTX25 platform is based on the proven Vermeer compact utility loader (mini skid steer) platform. Vermeer designed a hydraulic system specifically for the purpose of trenching and added controls that make it easy for the operator to steer the machine with the precision required when digging footings. The trencher boom can also be repositioned from an offset to a centre-mount position, allowing it to be used for other common trenching applications. Currently, most footings are dug using a trencher or a compact excavator. 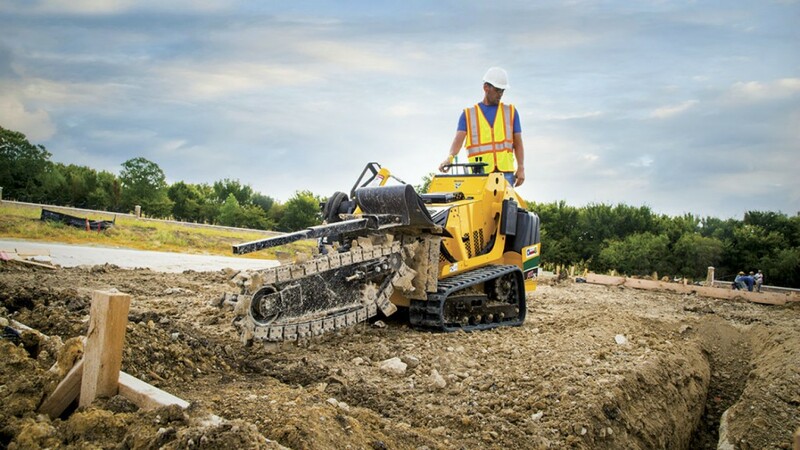 Trenchers offer an advantage over compact excavators – trenchers can cut to the precise dimensions and specifications required, thus removing only the amount of dirt necessary. Compact excavators can leave uneven trench walls and may not cut as cleanly as trenchers, removing more dirt than may be necessary. This “overdigging” with compact excavators can result in the use of more concrete which may equate to increased costs. The FTX25 offers two boom lengths – 20 inches (50.8 cm) or 26 inches (66 cm) — and can cut a footing trench up to 12 inches (30.5 cm) in width. A variable-position boom can be offset up to 2 inches (5.1 cm) outside the track undercarriage, allowing the operator to trench flush with the footing backer or form board. The trenching boom can be easily repositioned to a centre-mount position to accommodate other trenching applications, such as utility and irrigation installations. A hydraulic motor for the trenching boom eliminates the need for chains, which can help reduce maintenance and wear-item expense. A stand-on operator’s station offers excellent visibility to the footing trench while providing the operator a comfortable working platform. The FTX25 features a 25-hp (18.6-kW) Kohler EFI gas engine. The electronically fuel-injected engine eliminates the need for a carburetor, while also providing enhanced fuel efficiency and engine responsiveness. An overall machine width of 36 inches (91.4 cm) with 7 inch (17.8 cm) tracks or 40 inches (101.6 cm) with 9 inch (22.8 cm) tracks allows the Vermeer FTX25 to easily fit into tight jobsites more easily than a compact excavator. The FTX25 platform is based on the proven Vermeer compact utility loader (mini skid steer) platform.